No matter how carefully you try to look after your tropical aquarium, the chances are that you will suffer from a snail infestation at some point. Snails are most often introduced to the aquarium on plants, but they and their eggs can also be transferred when fish themselves are added. Because they are able to self-fertilise, it only takes one snail to start the problem. They can breed very fast and can soon overrun the tank. So how can you get rid of them? Snails thrive in brightly lit aquariums where there is lots of algae for them to live on, so keeping your tank clean is always a good idea. They will also eat your aquarium plants, but their favourite snack is leftover fish food. Reducing the amount you feed to your fish can slow the growth of the snail population and can also help to reduce the water balance problems which having a lot of snails can cause. In countries where garden snails are a popular snack, they are traditionally captured by turning a cup or plate upside down, putting a bit of lettuce under it, and leaving it on a grassy lawn overnight. You can use a similar trick on the floor of your aquarium. Use a plastic or pottery cup or plate so that you can be sure it's fish safe. Make sure your fish can't get under it to eat the lettuce. Leave it overnight, and when you pick it up in the morning you'll find that it's covered with snails. To make a significant impact on your snail population, you'll need to do this repeatedly, and you'll never be able to catch them all this way. However, this technique can keep your snail population below problem levels and can help to reduce the numbers before the application of chemical or biological techniques. 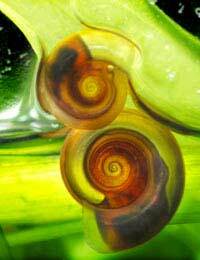 Most chemical methods of removing snails involve the use of copper sulphate. However, this is also poisonous to fish, although most species are able to withstand higher doses. It can be extremely hazardous for aquarium invertebrates like shrimp and coral, so should not be used if they are present. Because chemical treatments leave a lot of dead snails in the aquarium, it's vital that you remove the bodies (as many as possible) after use - otherwise they will decay and poison the water. The most effective way to keep snails out of your tropical aquarium is to keep some fish which eat snails. Most loach species are good at this, though some individual loaches never seem to get a taste for it. It's usually smaller snails which are a problem, but loaches can tackle them regardless of their size, being expert at removing them from their shells. Other snail eaters include banjo catfish and dorid catfish, puffer fish, bettas, barbs and angelfish. Goldfish will often try to eat them but are rarely as good at it. Loaches and omnivorous catfish are an especially good choice because they also eat the algae which forms a major part of the snails' diet. Of course, the best way to deal with snail infestations is to try and avoid them in the first place. Once you've dealt with one, you certainly won't want more! In order to reduce the chances of snails getting into your aquarium, it's a good idea to soak all plants in a poisonous solution before you introduce them. Needless to say, you should rinse your plants thoroughly after you have done this, so that the poison isn't transferred to your tank. This will also help to remove the bodies of dead snails. The most common approach to killing snails at this stage is to use bleach, but bleach can also damage plants, and can kill more sensitive ones. A better choice is a solution of potassium permanganate. Whatever you use, it's difficult to make sure that there are never any snails in your aquarium. But a few snails won't hurt, and if you're diligent about dealing with them, there's no reason why they should present a lasting problem. @Bob - I'd always go for a natural method such as blanching a piece of lettuce and placing it the tank, the snails will feed on this, meaning each morning you will be able to pick it out, with all the attached snails. On the other hand you could introduce snail-eating species of fish such as a puffer fish or a loach. I have a elephant nose,4 kuhli lochs 6hatchet fish what chem treatments are safe for these fish for snail infestation? Also what diseases can affect elephant noses & what treatments can be used safely many thanx for reply.